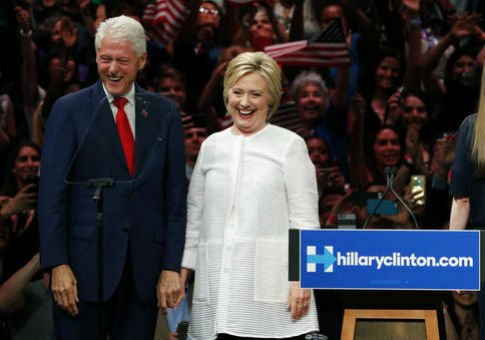 Bill Clinton was paid $5.6 million from an international for-profit educator after it entered into a partnership with the Clinton Global Initiative around the same time the former president hauled in $16.4 million from Laureate Education, tax returns show. GEMS Education, a Dubai-based education management firm, was founded by billionaire educator Sunny Varkey in 2000 and consists of over 90 schools in 12 countries. GEMS bills itself as a "broad-based education option." It is the largest global education management firm in the world offering K-12 instruction with offices in the United Kingdom, United States, India, Singapore, Saudi Arabia, Egypt, Qatar, Kenya, the United Arab Emirates, and Switzerland. Bill Clinton announced in 2010 that GEMS Education would become a strategic partner of the Clinton Global Initiative. Later that year, the Varkey GEMS Foundation, a global charitable foundation, was launched with Clinton named as its honorary chairman. "There will rarely be people who launch something with so much potential to lift the hopes and spirits and dreams of children as this foundation has done tonight," Clinton said at the foundation’s launch in December 2010. "The benefits from an educated child will affect not only the child itself, but his or her family and the wider community. The Varkey GEMS Foundation's commitment will bring that opportunity to millions more children around the world." The Varkey Foundation has poured between $250,000 and $500,000 into the Clinton Foundation since its inception, while GEMS Education provided between $1 and $5 million to the Clinton Foundation. Additionally, Bill began receiving payments from GEMS Education in 2011, tax records show. Clinton has hauled in millions from the vast GEMS for-profit network between 2011 and 2014. The first payment Clinton received from GEMS Education came in 2011 in the amount of $500,000, according to Hillary Clinton’s tax returns. In 2012, he earned another $1.25 million from GEMS. In 2013, the amount increased to $1.75 million. In 2014, the payments rose again to $2.125 million. Clinton has received a total of $5,625,000 from GEMS Education. GEMS did not respond to inquiries from the Washington Free Beacon seeking the amount Clinton made in 2015. It also did not answer whether it is still paying Bill. The payments from GEMS Education were made around the time Clinton pocketed $16.5 million from Laureate Education, the largest operator of for-profit colleges in the world. Douglas Becker, a major Hillary Clinton donor, is the founder, chairman, and CEO of Laureate Education Inc. Laureate Education paid Bill nearly $16.5 million to act as the "honorary chancellor" of Laureate International Universities between 2010 and 2014. When Hillary ran the Department of State, the agency funneled $55 million to the International Youth Foundation, which is chaired by Becker. Bill was serving as the honorary chancellor of Becker’s Laureate International Universities at that time. Laureate Education has entered into a partnership with the Clinton Global Initiative and given between $1 and $5 million to the Clinton Foundation. Walden University, an online component of Laureate, was slapped with a class action lawsuit much like Trump University. Graduate students said they penalized with added costs that left them heavily in debt. The suit was later dismissed. Hillary has knocked for-profit education institutions on the campaign trail, despite the fact that her family has raked in millions from those same institutions. She has touted a plan that would target for-profits that engage in fraud, deceptive marketing, and other illegal practices. Clinton’s campaign did not return a request for comment on the Clinton Global Initiative’s partnership with GEMS Education and Bill’s payments from that company. This entry was posted in Politics and tagged Bill Clinton, Clinton Foundation, Hillary Clinton. Bookmark the permalink.